I love cycling and I believe that as the voice for cycling in British Columbia, the BCCC continues to help make cycling better. It has been an honour to serve as president of this great organization and I would like to continue to help the organization to grow and become an even stronger voice for cycling in BC . Abandoned rail corridors have the potential to become amazing cycling corridors throughout the province. These could provide world class cycle touring opportunities as well as providing recreational opportunities and cycle commuting opportunities for BC residents. Though there are some decent rail trails on the Island and in the Okanagan, many rail trails are being destroyed by motorized recreational use. Before the 2010 Olympics, the provincial government initiated a “Trails of 2010” initiative which promised that many rail trails would be established for walking, cycling and equestrian use. The major one was the Kettle Valley Rail corridor between Hope and Nelson which is currently a portion of the Trans Canada Trail. Unfortunately, nothing was done to improve the trail and now much of it has been destroyed by motorized use. The provincial government has also established the “Experience the Fraser” initiative which would see trails on both sides of the Fraser between the Salish Sea and Hope, but again this project is languishing. Motorized use is totally incompatible with non-motorized use due to speed, noise and trail destruction. Note that there are many places for motorized trail use throughout the province. The rail trails are ideal for cycling and should be reserved for active transportation. I encourage you to work with the cycling, hiking and motorized groups in order to create world class cycle touring opportunities as well as trails which will attract many local residents to walk, cycle and ride horses. Support a 1.5m Safer Passing Law. Make our roads safer for cycling and walking. A Safer Passing Law requiring drivers to pass people cycling and walking by at least 1.5m would make our roads safer and more comfortable for residents and visitors. If there is more than one lane for traffic in the same direction, the driver would have to have to pass in the lane next to the one a vulnerable road user is traveling in. While progress has been made, still relatively few roads in B.C. have bike lanes or shoulders and many don’t have sidewalks especially in rural areas forcing people to share the road with high speed motor vehicle traffic. While we strongly encourage governments to invest in protected bike lanes, paths and sidewalks, building them could take years. In the meantime, a Safer Passing Law will help improve safety. The majority of drivers already pass people cycling and walking in a safe manner but the few that do not pose a potentially fatal risk to vulnerable road users. A Safe Passing law would help educate those that are unaware of how to pass safely and enable enforcement when needed. A cyclist can do little to avoid a hit from behind, and an objective, easy to estimate minimum passing distance is better than a subjective standard of safe driving behavior for much the same reason that a maximum speed limit is. Not only does the MVA not currently define a minimum passing distance for motorists overtaking cyclists, there is confusion as to whether the language in the Act even applies to passing cyclists. Section 157 states that an overtaking vehicle “must cause the vehicle to pass to the left of the other vehicle at a safe distance.” Bicycles, however, are not “vehicles” by definition under the Act at s. 1. In any event, even where courts have accepted that motorists have an obligation to pass cyclists safely, what constitutes as a safe passing distance remains unclear. A safe passing law would provide clarification that a motorist has a duty to leave a safe passing distance when passing a cyclist as well as definitive guidance on the minimum such distance. This avoids subjective assessments by motorist as to what constitutes a safe distance, and provide an objective standard for enforcement and education. Safe passing distances have been specified by over 27 jurisdictions in North America, including Ontario, Quebec and Nova Scotia. Following the death of rising cycling star Ellen Watters on a training ride in December 2016, the New Brunswick legislature is moving quickly to pass a safe passing distance law. Nevada’s safe passing law requires passing inimmediate left lane, if there is more than one lane in the same direction. Ottawa bike police are using a sonar device to measure the distance between drivers and cyclists. As in Ontario and other jurisdictions, we also recommend an educational campaign be undertaken to ensure motorists are aware of the law before enforcement campaigns. Tell them about your close calls or crashes caused by drivers passing too closely. Let them know that a safer passing law and enforcement would would help protect your family and friends. Yes. I Want a Safer Passing Law in BC! Thank you for supporting safer cycling in B.C. Your letter really helps! Please join me in helping to make BC safer for people who cycle and walk. Send a email in support of a Safer Passing Law in BC requiring motor vehicles to pass those cycling and walking by at least 1.5m. Let the political leaders know how a Safer Passing Law would make cycling safer and more enjoyable for you and your family and friends. Tell them about your experiences of riding on BC's roads and dealing with traffic. It only takes a minute or two and will really help make a difference! Yes. I support a Safer Passing Law! The Vancouver Seaside Greenway could be a world class walking and cycling experience which would attract more locals as well as people from around the world to enjoy this iconic route. Why then is it that so much effort is made to provide parking for cars, a restaurant and a museum and that recreational opportunities like tennis, swimming and basketball are encouraged but walking is unsafe on the official greenway path and cycling is very unsafe in this area? Doesn’t the vision statement speak more to walking and cycling than to driving and swimming? Why are walking and cycling left out of the definition of recreation but golfing is included? I urge the Park Board to improve the dangerous segment of the Seaside Greenway route in the Kitsilano Beach area immediately. Then we can invite the world to visit our world class greenway. Yes, I want a safe Seaside Greenway! Thank you for supporting the completion of the Seaside Greenway through the Kitsilano Beach area, your letter really helps! Your donation will help us make cycling safer for all, visit www.bikehub.ca to support our work. Q: Please rate how strongly you support or oppose the investment of $100 million per year over 10 years in cycling and walking. The BC government spends around $2 billion per year on transportation, primarily on highway expansion, road maintenance and transit. The BC Cycling Coalition estimates that it will cost around $2 billion to complete cycling networks and $2.5 billion to complete walking networks in communities across BC. The BC Cycling Coalition recommends that the BC Government invest $100 million per year over 10 years to help complete cycling and walking networks in communities across BC. This investment in protected bike lanes, paths, sidewalks and safer intersections would help people of all ages including children and seniors to safely cycle, walk and use wheelchairs. Thanks for your feedback. Unfortunately, with current funding levels it will take well over 50 years to get safe cycling networks throughout BC. We are recommending that the province accelerate their funding by investing a $billion to make this happen much sooner so that society can more quickly reap the benefits of more people cycling. We are encouraging the government to develop a provincial cycling strategy and this process would dictate how we can best move forward. We certainly encourage the government to increase investment in safe cycling infrastructure. With your support for our petition, we will be one step closer. Cyclng also offers many health benefits and more people cycling and walking means lower heath care costs. Everyone wins! Imagine that within the next ten years, you, your family and friends can safely and comfortably cycle and walk to work, school, and shopping as well as for recreation and exercise. And when you would rather take transit, there is a bus or a train nearby arriving within a few short minutes. To help make this a reality, the Province could eliminate the planned tax cuts for those earning over $150,000 per year and instead invest in cycling, walking and transit in communities around B.C. While more funding will be needed, especially in Metro Vancouver, this will be a great step forward. The higher tax bracket for people earning over $150,000 is set to expire at the end of 2015. This will result in a tax reduction worth around $225 million per year. Alberta just raised taxes on high income earners so it makes sense British Columbia not to cut similar taxes. Everyone, including those earning over $150,000, would benefit much more if the Province eliminated this tax cut and instead invested of this revenue in improved walking, cycling and transit in communities around the Province. Everyone's time is valuable. For example, someone earning $150,000 per year is 93 hours spent or $6700 worth of their time per year stuck in congestion in Metro Vancouver. Everyone benefits from safer roads. By enabling more people to choose cycling, walking and transit, there will be fewer cars on the road and thus fewer crashes leading to fewer injuries and fatalities. Everyone benefits from a strong economy. 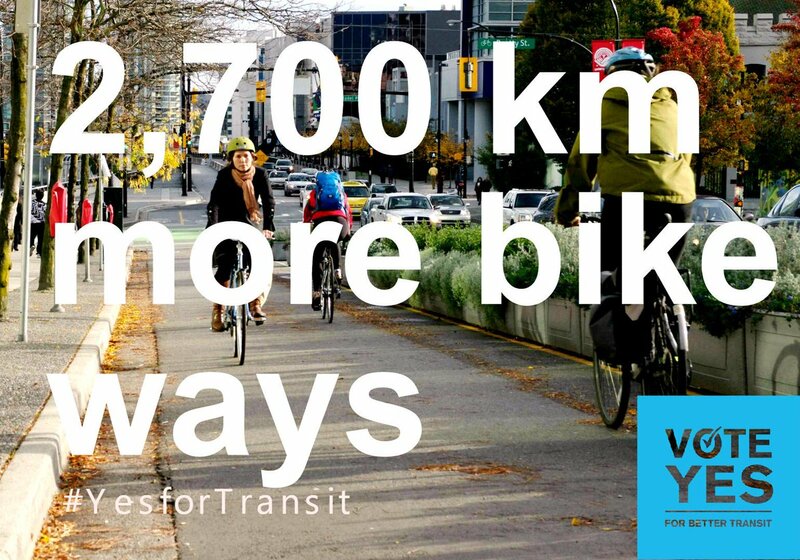 Transit, cycling and walking are affordable transportation. People cycling and walking are more productive at work. Cycling tourism has huge potential in B.C. For example, in Oregon, cycling tourism contributes $400 million per year to the economic. Everyone benefits from healthier transportation. More people walking, cycling and transit reduces health care costs through increased physical fitness. Petition to Honourable the Legislative Assembly of the Province of British Columbia, in Legislature Assembled. We the undersigned, draw your attention to the health, economic, environmental and social benefits of walking, cycling and transit. Your petitioners call upon the B.C. Legislature to extend the higher tax bracket for people earning over $150,000 beyond 2015 and invest the $225 million per year of revenue in improving walking, all ages & abilities cycling and transit in communities across British Columbia. Imagine that within the next ten years, you, your family and friends can safely and comfortably cycle across the region to work, school, shopping and transit as well as for recreation and exercise. And, when you would rather take transit, there is a bus or a train nearby arriving within a few short minutes. Cycling routes parallel to LRT lines in Surrey and Langley. Improvements to the Motor Vehicle Act including allowing riding 2 abreast and a safe passing distance law. If you would like to provide on-going support for our advocacy efforts and programs, please consider making an on-going monthly donation.